Delsea girls’ soccer won the South Group 2 championship on Friday. 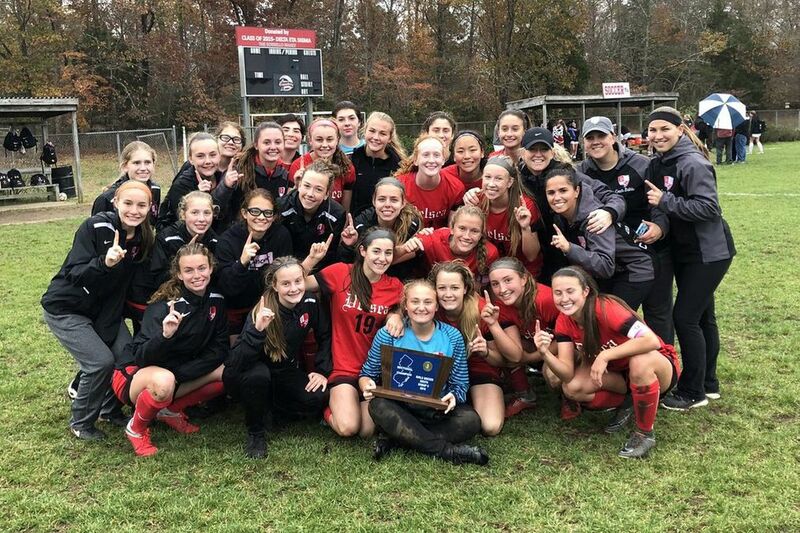 After a scoreless regulation and two scoreless overtime periods, Delsea defeated Cinnaminson on penalty kicks Friday for the South Group 2 Girls' Soccer title and Delsea's first sectional championship since 1993. Goalkeeper Allison Gebhart made the winning save in the fifth round of penalty kicks. She made 13 saves in the game. Eastern defeated Shawnee on penalty kicks to win the South Group 4 championship and claim its first sectional title since 2006. Marissa Feltoon scored the game-winner in the sixth round of penalty kicks. The game was tied 2-2 after regulation as Kiko Kokolis and Kelli McGroarty scored for Eastern. Goalkeeper Olivia Alves made seven saves. Maddie Spink Scored twice, and Quinci Bantle and Emily Owens added goals as Audubon defeated Schalick, 4-2, in the South Group 1 final. Emily McGrath had two assists, and goalkeeper Aysiah Maldonado made eight saves. Schalick's Maresa Savarese scored two goals in the loss. Cici Imhotep, Ashley Nutt, and Izzy Perham scored in the second half to give Moorestown a 3-0 victory in the South Group 3 final. Nicole Quintero saved six shots in goal. It is Moorestown's first sectional title since 2014, when they won three in four years. Davis Smith caught a 26-yard touchdown pass and returned an interception 45 yards for a score in the fourth quarter to secure Haddonfield's 28-6 win over Pleasantville in the South Group 2 semifinals. Pleasantville led 6-0 at halftime before Davis' long kick-off return set up a Jay Foley touchdown run to start the third quarter. The Bulldawgs will face either Camden or West Deptford, who play at 3 p.m. on Saturday, in next Friday's championship game. Demie Sumo ran for a 29-yard touchdown and a 26-yard score in the second half as Willingboro defeated Florence, 22-6, in the Central Group 1 semifinals. Nasir Murray also had a touchdown run. Asbury Park and Paulsboro play at 1 p.m. on Saturday to decide who plays Willingboro in next Friday's sectional title game. Elijah Gray tossed a touchdown pass and ran in three scores as Holy Spirit defeated Hudson Catholic, 48-16, in the Non-Public Group 2 semifinals. Walid Jones scored two defensive touchdowns. Holy Spirit will play the winner of Saturday's game between St. Joseph and Immaculata in the championship on Nov. 23.